Hello everyone, my name is Flora! Here at my cafe I will post movie and book reviews, video game tips (I specialize in Animal Jam and minecraft), fanfictions, and all things My Little Pony FIM. Be sure to follow me for everything listed above. 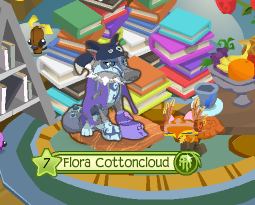 You can meet up with me through Animal Jam, my username is CelestiaRings. Please follow http://tweenfictiongirl.wordpress.com/category/books/ as well! My main character in the game and in fanfictions!